After a handful of outings in the Arcades, on 13th September 1985, Mario went Super and received his first full console debut. With the video game market in such jeopardy, it was Super Mario Bros. that started a phenomenon for Nintendo and their NES. Selling over 40 million copies in its almost 30 years on the market, it is one of the biggest games of all time. Such a game may only come once in a generation. Super Mario Bros. features Mario as he traverses the Mushroom Kingdom in order to save Princess Toadstool from the evil Koopa King Bowser. The player must overcome 8 worlds each consisting of 4 side scrolling levels. Mario’s main form of defence is his ability to jump very high, allowing you to squish almost every enemy in the game. However he is pretty vulnerable to attacks so the player must grab a Super Mushroom or a Fire Flower in order to make him grow to twice his size and shoot fireballs respectively, effectively bulking him up to take a hit. He can also grab a Starman which will temporarily give him invincibility as well as sparkle with some trippy music to boot. He can be joined by his brother Luigi in 2-player mode, which see’s players take it in turns to overcome each level in a more head-to-head environment. These guys gonna mess you up Mario… RUUUUNNNN!!! The level design in the game is highly commendable as are the physics that tie it all together, with levels ranging from underground caves, giant mushroom platforms, swimming underwater or being chased by Lakitu in the clouds. Some layouts are repeated in later levels but with added obstacles that prevent them from coming across as unwelcome or lazy. These are joined by a memorable cast of enemies who all require a different strategy to defeat albeit usually one that involves jumping on their head at the right moment. Highlights are the Hammer Bros. whose tricky ways are nothing but satisfying to overcome. However the Mushroom Kingdom is a cruel place and power-ups are often placed at the peril of the player, with Mushrooms gliding away from you being a particular tease at times. Players cannot simply grab everything on screen to their heart’s content and often have to watch their power-ups disappear to prevent another precious life being lost. This is a game where the player must practice discipline. Yep… after all that effort a new quest. Sure that’s what everybody wanted to hear! This discipline comes through learning the game’s aforementioned physics, which are very demanding on the player considering a game over, is taken literally here. Perhaps it is in this respect the game may lose a lot of gaming audiences today as with the industry focusing more on helping the player complete the game, many may be turned away from the challenge here. Furthermore the game only scrolls to the right meaning once what is behind you is off-screen, it’ll remain that way, a concept that will seem foreign to the younger player. Yet neither of these aspects should turn anyone away from this game, getting good at it feels extremely rewarding and learning where all the hidden blocks and pipes are adds replay ability without the need to bombard us with unlockable content. 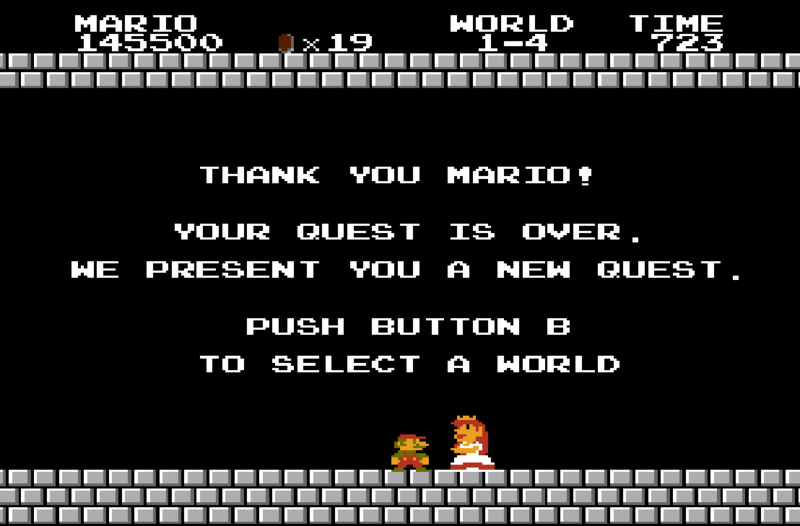 While the ending itself may be bittersweet, the new quest the Princess gives us brings a whole new difficulty level to the game that by the time of its completion is a more than welcome addition to those of us who have really got the hang on this world. It must be said that nobody should turn away from a game where the physics still outshine many of its competition today. 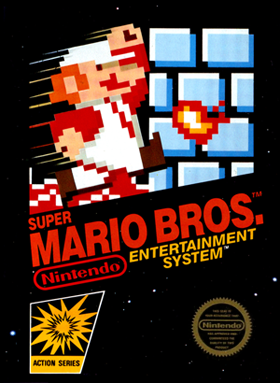 Ultimately while aspects of Super Mario Bros. might not be appreciated by a newer generation of gamers, one cannot overlook this game in any respect and it is what it does right, which is so much, which has us return for more almost three decades on. To gain a greater idea of the features found within this game check out this most excellent video. Still one of the few games you can not only get to where the HUD is displayed in game but also access a secret that way.